With the United States’ thrilling 6-3 victory over the defending-champions Dominican Republic on Saturday night, the semifinals for the 2017 World Baseball Classic are set: Puerto Rico will play the Netherlands on Monday night, with the US squaring off against Japan on Tuesday. Both games will start at 9 PM EDT, and will be televised on MLB Network. Who will walk away with the title? Let’s look at the tale of the tape. Puerto Rico cruised through Pool D in Jalisco, Mexico, mercying Venezuela 11-0 in 7 innings then running Mexico and Italy off the field 9-4 and 9-3, respectively. In the so-called “Group of Death,” Puerto Rico proved their mettle against stiffer competition. They won close-fought victories over the Dominican Republic 3-1 and the United States 6-5, as well as a 13-2 drubbing of a Venezuelan team that was already mathematically eliminated from the tournament. Their run differential sits at a staggering 51-15. Bottle-blonde hair? It’s working for Puerto Rico. The Dutch advanced in second place from both their pools. In Pool A they went 2-1, sneaking past Chinese Taipei 6-5 and defeating Korea 5-0, but lost 4-2 to tournament-Cinderellas Israel to close play in Pool A. In second-round play, they opened with a wild extra-innings 8-6 loss to Japan. They followed up that loss by putting up crooked numbers against Cuba and Israel to advance into the semifinals. On the Dutch side, Wladimir Balentien has had a great tournament (.591/.654/1.000), but I’m more interested in what’s going on with Xander Bogaerts. Arguably the biggest name on this Dutch roster, Bogaerts has had a quiet tournament thus far. He’s gone 4-for-19, with no extra base hits since his triple in the opening game of the tournament against Korea. He’s done well on defense, spending time both at third and short, but the Netherlands are going to want his bat at full force going into the semifinals. UPDATE: Didi Gregorius was removed from the Dutch roster this morning due to an injury to his right shoulder. He had been one of the Netherlands’ top hitters, batting .348 with 8 RBIs. It’s hard to find fault with Puerto Rico’s performance so far. The defense has been stellar, committing only one error all tournament. They’ve been squaring up the ball in their at-bats. Against Venezuela on Saturday, every single batter in the lineup got a hit. Their bullpen has been strong as well. Closer Edwin Diaz has two saves to his name, despite some late drama against the United States Friday. Since I’m contractually obligated to point out a weakness with this team, I’ll point out their weakness at first base. T.J. Rivera has gone hitless in his last two games, and has posted just a .071 average for the tournament. The pitching staff is the weak point of the Dutch team, particularly the starting rotation. Some, like Diegomar Markwell, have put together good tournaments, but on the whole the staff has been average. They put themselves in early holes against Chinese Taipei and Israel in the first round, and found themselves in a similar hole against Japan in the second. The lack of big-league talent on the pitching staff is also somewhat troubling, given the talent of the lineups the Netherlands will be facing in the semifinals and finals, should they advance. Diegomar Markwell has been a bright spot for the Dutch pitching staff working as a starter and out of the bullpen. This game will be closer than most expect. 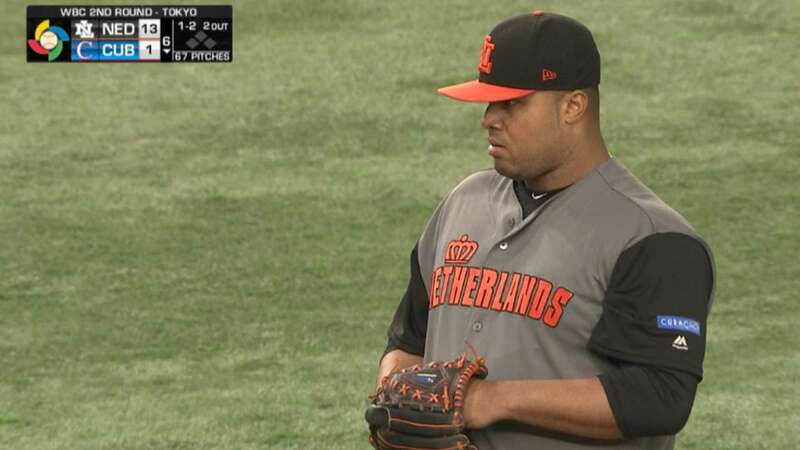 The Netherlands has put up big-time numbers, and if they can get Bogaerts and Schoop to produce this could be a high-scoring game, even with both teams boasting great defensive talent. But I have a difficult time seeing how the Dutch pitching staff is going to cool off the red-hot bats of Puerto Rico. Final Score: Puerto Rico 7, Netherlands 4. The United States have been the cardiac kids of the WBC. They rallied to beat Colombia 3-2 in 10 innings, fell victim to a boisterous Dominican comeback in Miami, and then calmly defeated Canada 8-0 to advance to the second round. In San Diego they stormed back to defeat Venezuela 4-2, plating 3 runs in the 8th inning. They almost came back against Puerto Rico in their next game, but fell just short in a 6-5 loss. Then, in a de-facto tiebreaker game, they again relied on 8th inning heroics to ensure a 6-3 victory over the Dominicans — along with a monster blast from Giancarlo Stanton. Japan has never looked challenged in this tournament, cruising through the first round against Cuba (11-6), Australia (4-1), and China (7-1). In the second round they were pushed to the limit against the Netherlands, winning in extras 8-6, then dispatched Cuba 8-5 and Israel 8-3. They’ve been buoyed by the home crowd, playing all of their games in the Tokyo Dome. Historically the United States has struggled with their starting pitching, but this year that’s been the teams’ strength. They’ll turn to Tanner Roark and, if they advance, Marcus Stroman to continue to trend of quality starts for the US arms. The major weakness of the US team has seemed to be their propensity to rely on late-game heroics. It served them well against Colombia and Venezuela, but the comeback came up short against Puerto Rico in Pool F. Should they fall behind to Japan, the lineup may struggle to start a comeback against Japan’s strong bullpen. 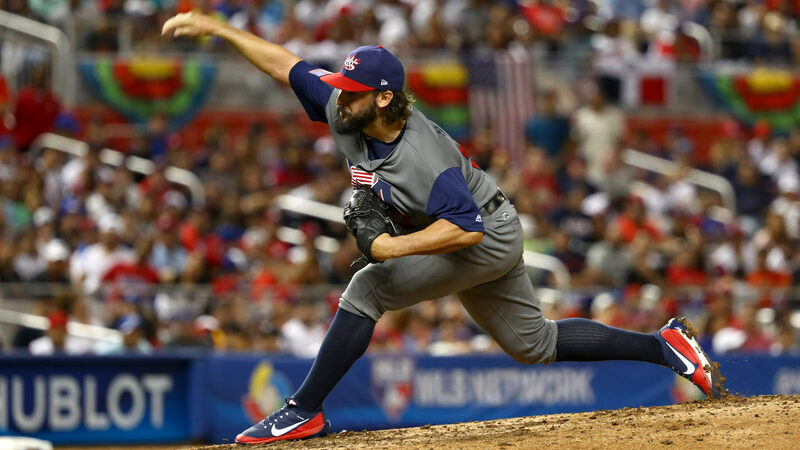 Tanner Roark struggled against the Dominican Republic in Pool C, but looks set to toe the rubber against Japan in the semifinals. Japan came into the tournament preaching about the benefits of playing small-ball, but they’ve done nothing but bash home runs in the Tokyo Dome. Those home runs have powered their offense, but in pitcher-friendly Dodger Stadium (29th in MLB park factor run average in 2016), the Japanese are going to have to produce runs while keeping the ball in the park. Japan has cruised through the tournament so far behind the home fans and a relatively easy schedule. They’re about to get a rude awakening from the Americans, who will have the crowd on their side, and have all the momentum coming off of their 6-3 win against rival Dominican Republic. There’s a lot to like with this Japanese team, but there’s more to like in the US lineup. Final Score: United States 6, Japan 4. Those predictions would set up a final between Puerto Rico and the United States, which would be one for the ages. Puerto Rico’s incredible infield of Javier Baez, Francisco Lindor, and Carlos Correa against the big bats of the US lineup. The bleached blondes against the American Eagles. That would be the fitting conclusion to what has been a fantastic tournament. And I think it would give the hometown fans something they’ve been waiting a long time for: a United States victory, with one more set of late-game heroics. Final Score: United States 8, Puerto Rico 7 (in extras).